Verbatim Clip-its – When A Paperclip Loves A Flash Drive Very Much… | OhGizmo! 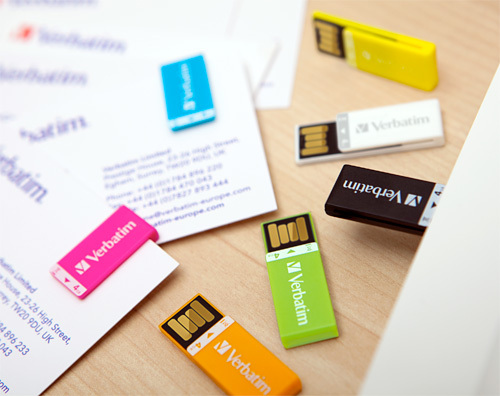 It’s hard to imagine someone making something as simple as a USB flash drive more useful, besides of course larger capacities, but Verbatim’s Clip-its are a clever mashup of a flash drive and a paperclip that end up being greater than the sum of their parts. Designed by Arman Emami the Clip-its were awarded a much deserved Red Dot ‘Best of the Best’ 2010 design award and I’m sure they’ll be quite popular at CES next year clipped to brochures, press releases and other ancient forms of communication. No word on pricing just yet, nor mention of them on the North American Verbatim site, but they’ll be available in 2GB or 4GB capacities, and hopefully not just in Europe. They need to make these cheap as hell, and include smaller sizes like 512MB and 1GB, because they would make awesome conference giveaways. Just attach them to your printed materials, and away you go. OH wow, no way dude that is just WAY too cool!